The world is about to see the most powerful rockets of all time roar to life. Here’s how SpaceX, Blue Origin, and NASA’s newest rockets compare. Saturn 5, used by NASA between 1967 and 1973, is still the biggest and most powerful rocket ever built. It was used for human exploration of the Moon and was later used to launch the first American space station Skylab, which orbited Earth from 1973 to 1979. Here is the July 16, 1969 TV broadcast of the launch of the Apollo 11 Saturn V rocket which carried astronauts Neil Armstrong, Buzz Aldrin and Michael Collins to the Moon. Probably the most important moment in humanity’s history so far. And below the raw clip from Camera E-8 on the launch umbilical tower/mobile launch program of Apollo 11. See how a powerful beast the Saturn V was. Falcon Heavy, previously known as the Falcon 9 Heavy, is a variant of the Falcon 9 launch vehicle and will consist of a strengthened Falcon 9 rocket core, with two additional Falcon 9 first stages as strap-on boosters. With the ability to lift into orbit over 54 metric tons (119,000 lb) – a mass equivalent to a 737 jetliner loaded with passengers, crew, luggage, and fuel. Falcon Heavy can lift more than twice the payload of the next closest operational vehicle, the Delta IV Heavy, at one-third the cost. Falcon Heavy draws upon the proven heritage and reliability of Falcon 9. Its first stage is composed of three Falcon 9 nine-engine cores whose 27 Merlin engines together generate more than 5 million pounds of thrust at liftoff, equal to approximately eighteen 747 aircraft. Only the Saturn V moon rocket, last flown in 1973, delivered more payload to orbit. Falcon Heavy was designed from the outset to carry humans into space and restores the possibility of flying missions with the crew to the Moon or Mars. On December 20, 2017, SpaceX founder Elon Musk has released the first pictures of the company’s Falcon Heavy booster on Twitter. The photos show the powerful rocket in its hangar at the Kennedy Space Center, where it is getting prepared for its long-awaited maiden flight in January 2018. Musk also tweeted that the first payload will be his “…midnight cherry Tesla Roadster playing Space Oddity. The destination is Mars orbit. Will be in deep space for a billion years or so if it doesn’t blow up on the ascent.” The rocket will boost the electric car past the orbit of Mars on a trajectory around Sun, Musk said. The first photos of SpaceX Falcon Heavy rocket, published by Elon Musk on his twitter account. When exactly will the maiden flight will be, still not announced. Since the Saturn V made its last flight in 1973, Falcon Heavy will be world’s most powerful rocket still in use, when it flies. SpaceX also published a flight animation of Falcon Heavy, you can watch it below. Update: SpaceX’s Falcon Heavy test flight (February 6, 2018) was successful and the rocket’s upper stage, together with Elon Musk’s electric sports car Tesla and the dummy “Starman”, are on their way to Mars. Announced in September 2017, it is SpaceX’s privately-funded launch vehicle, spacecraft and space and ground infrastructure system. The newly updated launch vehicle system would be a 9-meter (30 ft) diameter technology, using methalox-fueled Raptor rocket engine technology directed initially at the Earth-orbit and cislunar (between te Earth and the Moon) near-Earth environment before, later, being used for Mars missions. 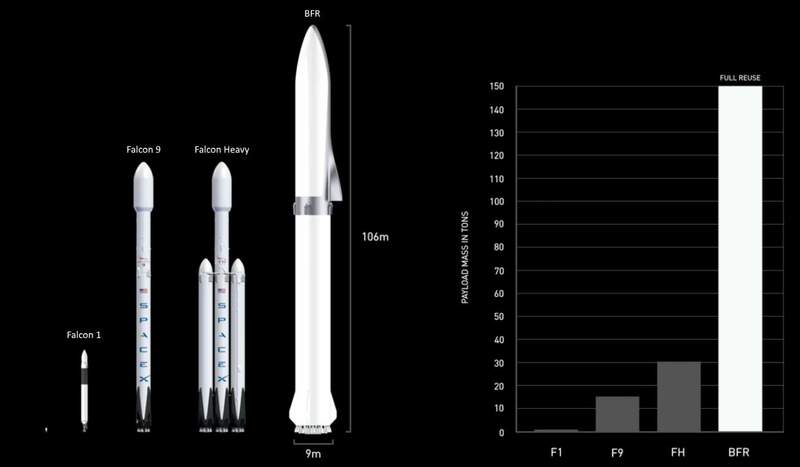 The updated (smaller) BFR is 106 meters (348 feet) tall. When completed, Falcon BFR will be most powerful rocket ever built. Evolution of SpaceX rockets. Falcon 1 is a two-stage-to-orbit launch vehicle privately developed and manufactured by SpaceX during 2006-2009. It was 21.3 meters (70 feet) tall with a diameter of 1.7 meters (5.5 feet). Its weight was 38,555 kg (85,000 lb) with a payload capacity of between 670 kg (1480 lb) to the Low Earth Orbit (LEO) and 430 kg (990 lb) to the Sun-synchronous orbit (SSO). Falcon 1 achieved orbit in September 2008 on its fourth attempt, with a mass simulator as a payload. On July 14, 2009, it made its final flight (fifth launch overall) and successfully delivered the Malaysian RazakSAT satellite to orbit. It was also SpaceX’s first commercial launch. Following this last launch, the Falcon 1 was retired and succeeded by Falcon 9. Elon Musk says “9 years ago SpaceX nearly failed itself out of existence: the first three launches failed. And fortunately the fourth launch, which was, that was the last money that we had for Falcon 1. That fourth launch worked.” Falcon 9 is also a two-stage-to-orbit launch vehicle like Falcon 1. It is named for its use of nine first-stage engines. The “Full Thrust” version is 70 meters (230 feet) tall with a diameter of 3.7 meters (12 feet). It can lift payloads of up to 22,800 kilograms (50,300 lb) to low Earth orbit, and up to 8,300 kg (18,300 lb) to geostationary transfer orbit (GTO). The initial version 1.0 flew five times from June 2010 to March 2013, version 1.1 flew fifteen times from September 2013 to January 2016, and the current Full Thrust version has been in service since December 2015. Falcon Heavy, previously known as the Falcon 9 Heavy, is a variant of the Falcon 9 launch vehicle and will consist of a strengthened Falcon 9 rocket core, with two additional Falcon 9 first stages as strap-on boosters. The last one is Falcon BFR. When completed, it will be most powerful rocket ever built. NASA’s Space Launch System, or SLS, is an advanced launch vehicle for a new era of exploration beyond Earth’s orbit into deep space. It will launch astronauts in the agency’s Orion spacecraft on missions to an asteroid and eventually to Mars while opening new possibilities for other payloads including robotic scientific missions to places like Mars, Saturn, and Jupiter. SLS is designed to be flexible and evolvable, to meet a variety of crew and cargo mission needs. In 2015, NASA completed the critical design review – a first for a NASA exploration class vehicle in almost 40 years — and continues to move forward with production of the launch vehicle. Engineers are making rapid progress aimed toward delivering the first SLS rocket to NASA’s Kennedy Space Center in Florida for its first launch. As of December 2017, Flight hardware is currently in production for every element. 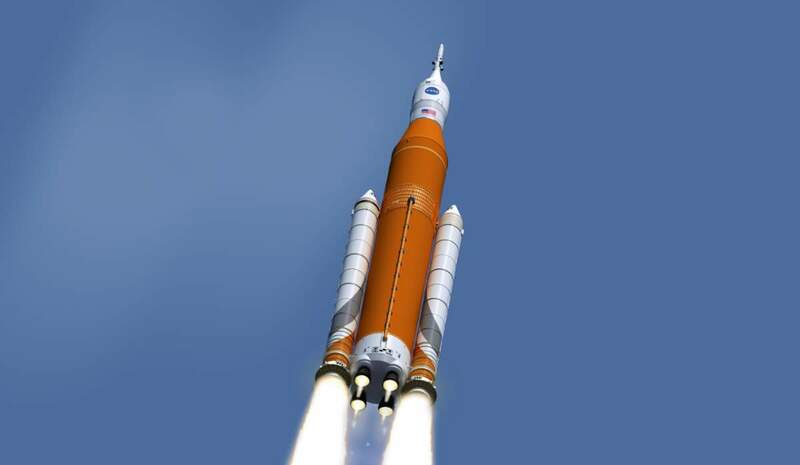 Artist’s conception of the NASA’s Space Launch System (SLS) and Orion capsule. The New Glenn is a privately funded orbital launch vehicle in development by Blue Origin, the American privately funded aerospace manufacturer and spaceflight services company set up by Amazon.com founder Jeff Bezos. Design work on the vehicle began in 2012 and it is expected to make its initial test launch prior to 2020. New Glenn is described as a 7-meter-diameter (23 ft), two- or three-stage rocket. Its first stage will be powered by seven BE-4 engines that are also being designed and manufactured by Blue Origin. The New Glenn’s first stage is designed to be reusable. Low Earth orbit (LEO) is an orbit around Earth with an altitude between 160 kilometers (99 mi) (orbital period of about 88 minutes), and 2,000 kilometers (1,200 mi) (orbital period of about 127 minutes).